NO COST to you for parts and activation with only a $99 installation charge and the purchase of alarm monitoring services. See terms and conditions to this offer below. With your purchase. While supplies last. Call now and receive $100 Visa Gift Card! Think of it as a way to cover the cost of your $99 installation charge while still having a $1 to spare. If there was ever a time to jump on a special, it’s NOW! By calling now, you can get your very own state-of-the-art ADT Monitored Home Security System an $850 in value for JUST $99 installation charge and purchase of alarm monitoring services. Your Free ADT Monitored Home Security System includes: 7 door or window contacts, 1 infrared motion detector pet friendly, 1 digital keypad with police, fire and medical emergency buttons, control panel and backup battery, lawn sign and window stickers. And for limited time also receive Free $100 Visa gift card. 6 Customer Alarm Monitoring Centers are strategically placed throughout the United States to provide the best network possible. With highly trained professionals watching your home 24/7, there is not much more one could ask for. All businesses and homes have continuous security thanks to the sophisticated Monitoring systems of ADT’s. And by no means is it JUST an alarm system as each ADT Monitored Alarm System protects you against fire, carbon monoxide, burglary and much more. How Does Each System Work? When your alarm system is triggered, your system will connect to ADT’s comprehensive network of Customer Alarm Monitoring Centers. ADT fire, monoxide, police and medical emergency services will be “Always On” even if your security system is not armed. As the alarm is triggered, you will have police, fire department or an ambulance at your door in no time even if you are not home thanks to ADT security. ADT stays one step ahead of the competition with wireless security systems. Other home security alarm companies still offer traditional wired systems that are cumbersome to move and difficult to install, with the need for hundreds of feet or wire and holes in your walls. ADT's wireless systems offer a bigger bang for your buck with wireless contacts and a free keychain remote. With any other home security alarm company, you pay to lease their alarm system. When you purchase a system from us, you are the owner of that system. ADT even offers a Mover's Security Guarantee (certain restrictions apply), making sure that your system goes with you and gets set up again, should you decide to move. When it comes to dealing with your life, there is no time to mess around. This is precisely why you want to rely on ADT, as highly trained security professionals are ready every minute of the day in the event that an emergency were to occur. Every ADT employee undergoes rigorous training. And all technology will pinpoint the exact area of the break-in or fire in your home. Skilled ADT professionals are waiting 24/7 in the event that an alarm triggers one of the ADT’s monitoring centers. Thanks to sophisticated technology, skilled professionals will respond in an instant. ADT has packages as low as $1.10 per day, a small price to pay for peace of mind. Every ADT security system comes with savings and guarantees. You can also save up to 20% on your homeowners insurance just by owning an ADT monitored security system. Don’t Wait For The Worst! 1 out of every 5 homes will have a burglary, fire or carbon monoxide poisoning over the next 6 years. 9 out of 10 convicted burglars admit they would avoid houses protected by alarm systems. 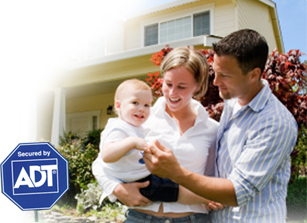 Your home is 3 times less likely to be burglarized with an ADT alarm system. 1 out of 3 homes will suffer from a medical emergency this year. Things can go wrong and ADT understands this with their multi-tiered disaster preparedness procedures and Internal Disaster Management Program ready for almost all emergencies. ADT professionals work with interconnected network of Customer Monitoring Centers while using powerful computers, multiple backup systems and secure communication links. With an ADT monitored Alarm System you may be eligible for up to a 20% discount off the annual homeowners insurance cost. Call your ADT Authorized Dealer BEC Alarms today! This simple call will have a home security specialist at your home to evaluate your security needs while presenting numerous options. There are no obligations in scheduling – just an expert looking to help. The time is now to act on your home security needs as it can help protect your home, belongings, and loved ones. An ADT Monitored Security System will finally give you and your family the peace of mind you deserve! © 2019 BEC Aalarms, Inc. All Rights Reserved. ADT Logo is a Registered Trademarks of ADT.